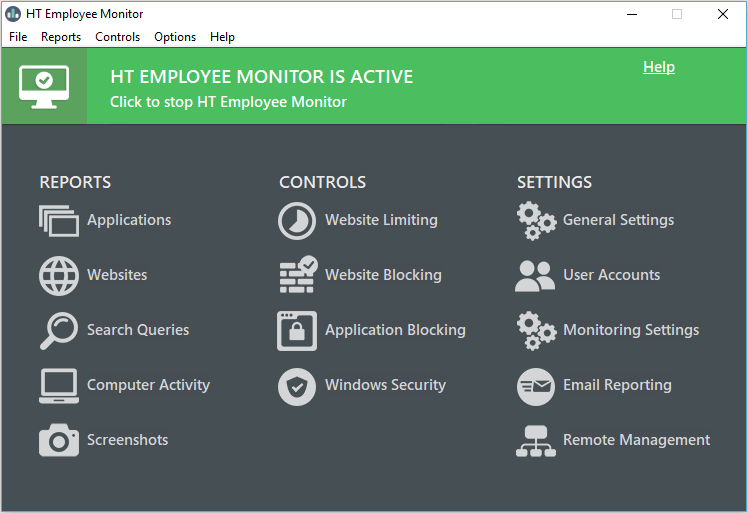 HT Employee Monitor is professional blocking and monitoring software for employers who want to block or limit non-word related computer activities. Monitor your workers' activities and analyze their productivity. Block or limit social networks, chats, games, certain websites, and applications. Help your users remotely - no more trips to other locations. Controlling your company computers lets you both improving productivity and enhance network security. Manage your employees' computer activities and make them more efficient. Don't want to block non-work-related websites completely? 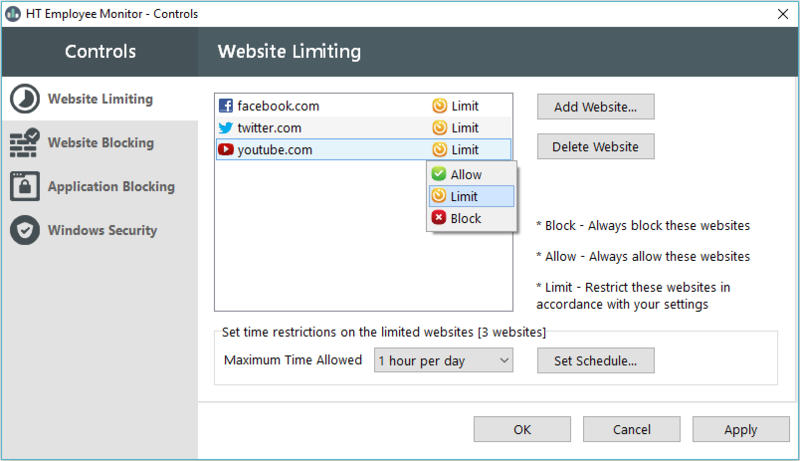 The Website Limiting helps manage when and how much time your users can spend on certain websites. Set time limits or a schedule for social media sites, video, news, or any other websites easily. Games, messengers, players, can be a significant problem in the workplace. 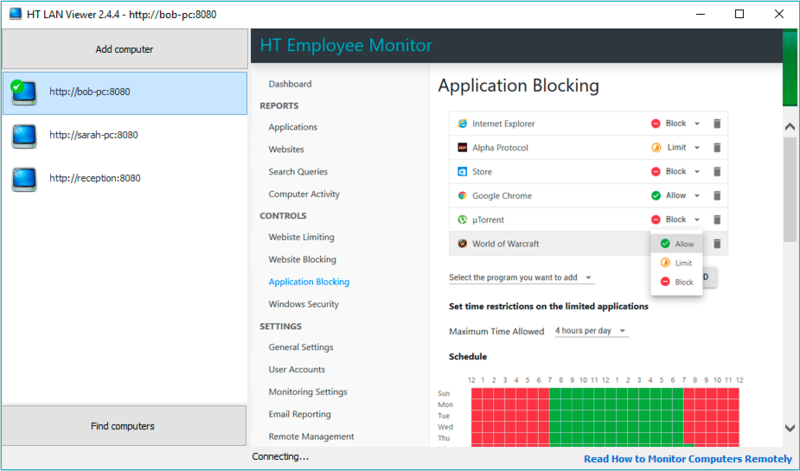 With HT Employee Monitor you can block any program you wish. 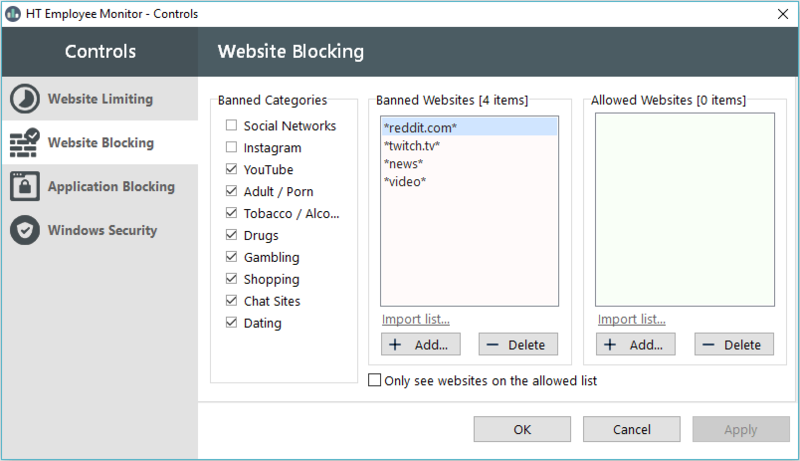 Together with the Website Blocking, that allows taking full control over what users are doing online and offline on your computers. Monitor your computers, view logs and set up the filters remotely. No more trips to other locations. 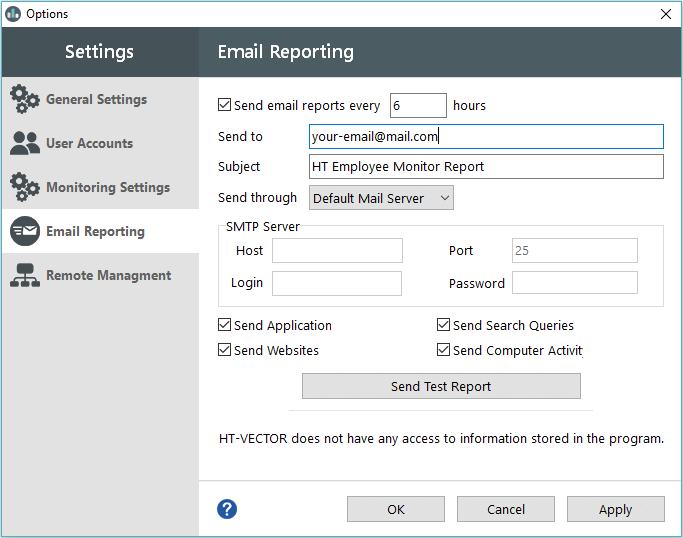 In addition to email reporting, with HT Employee Monitor, you can be aware of your users' activities and configure the filters remotely in REAL-TIME. Do both monitor and filter activities with just a few clicks on remote computers on the same network. 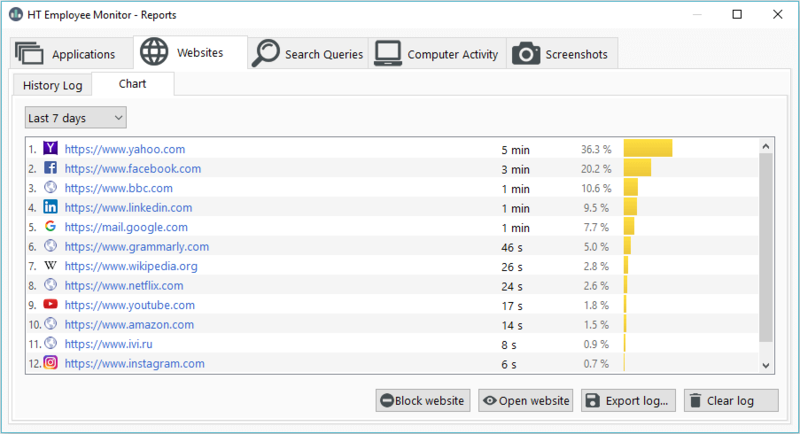 See what websites were visited and how much time was spent on each one. Even if a user clears his browser history, HT Employee Monitor remembers them all. The software supports Google Chrome, Firefox, Microsoft Edge, Internet Explorer, and Opera. HT Employee Monitor records applications launched and reports active usage time. You can find out where your employees waste time and optimize their performance. The detailed report will show information about each launched application on a particular PC. Our employee monitoring software tracks the time when the computer was active, turned on and off, idle time, etc. 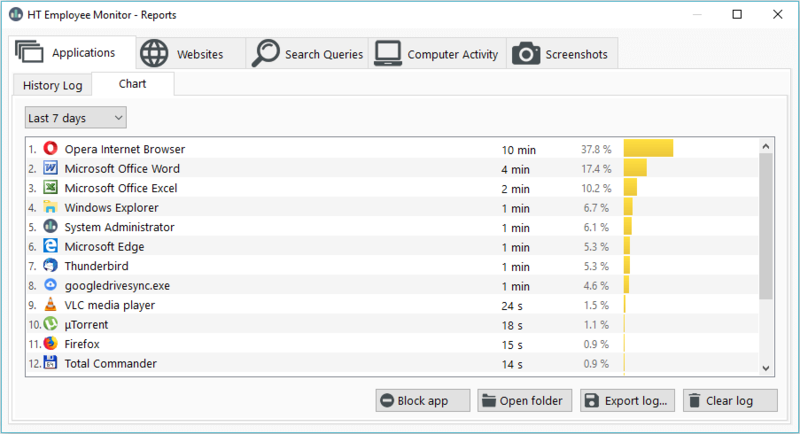 So you can view statistics of the use of a particular PC by particular users in a convenient graphical form. Our employee monitoring software reports about idle time. See how much time your employee spent at the computer and out. 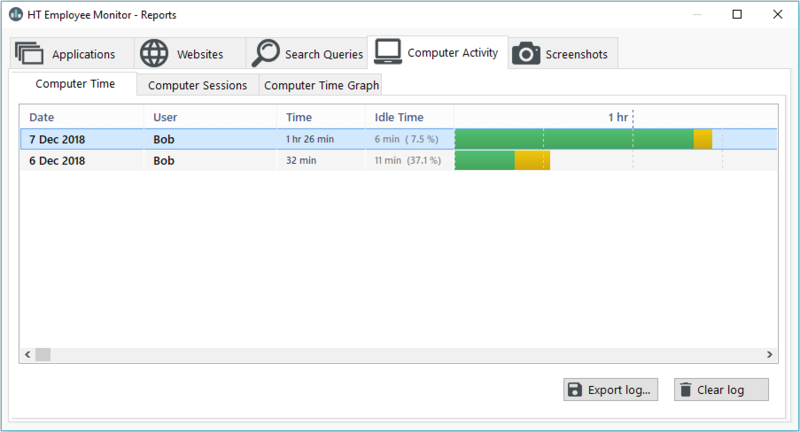 By default idle time is counted after five minutes of inactivity, this time can be configured. The screenshots provide you with a visual report of employees' activities. HT Employee Monitor captures a computer screen with customizable intervals and image quality. This is the easiest way to find out if the computer was used for work or for entertainment. A separate log will show all queries made by users in search engines so that you can evaluate what information users are looking for. The software supports all popular search engines, Google, Yahoo, Ask and Bing. The best employee monitoring software. I became a real fan of the program and recommended it to other managers. All of the promised features work perfectly. The software is easy to use and functional. I want to acknowledge the excellent work of your support team. Website blocking and limiting is an excellent function that lets us restrict employees from different distractions at the office. We are really happy with your product. Thank you very much for your effort! Personally, I have tried many monitoring programs, and each one was good in its own way. However, HT Employee Monitor has some advantages. The first, it does not slow down PCs. The second, not many employee monitors can boast a combination of monitoring & blocking features. HT EM perfectly blocks inappropriate pages. Undoubtedly, this is a worthy choice. Monitor activities and block distractions. Both monitoring and blocking features are in one program. 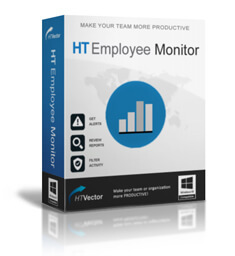 HT Employee Monitor allows you to manage your employees' activities in a few clicks without getting up from your chair. Cut down on distractions and make sure your employees are engaged in work-related rather than personal activities. Use our employee monitoring software to help your employees improve productivity and get rid of procrastination. Block all non-work related activities in real time, even from remote locations. Statistics confirm that blocking improves employee productivity by at least 30%. Your profit will increase together with productivity. The program allows you to monitor and limit every user account on your PCs. Managing users with administrator rights is also available. You can create different restrictions for different users, monitor and limit them with our computer monitoring software in different ways. The software works in a stealth mode. It runs silently in the background and does not appear in the All Programs menu, the Add/Remove menu, on the Desktop, etc. Only the owner of HT Employee Monitor who knows the special hotkeys and password can access the program. 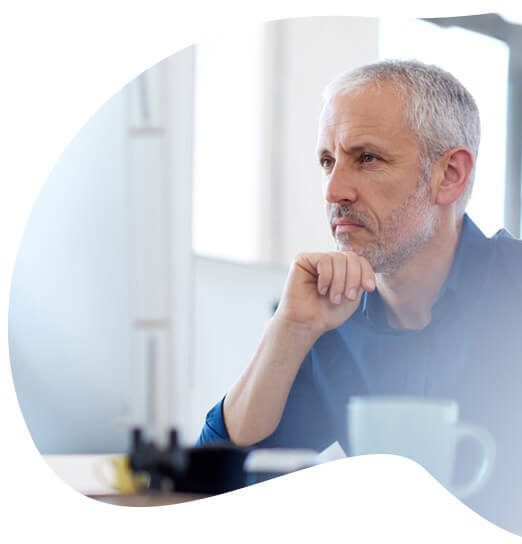 Together with the opportunity to monitor employees in real time, the software provides you with email reports that contain a wide array of logs. With HT Employee Monitor receive emails with reports hourly and view logs from anywhere you can access your email. 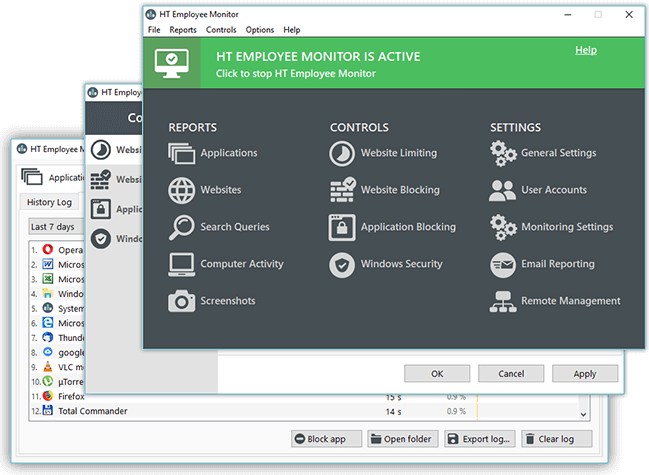 Install HT Employee Monitor on the computer(s) you want to manage. The installation takes less than a minute. Specify rules for computer use, what is allowed and what is not. Remote configuring is available. View all computer activities via detailed email reports or remote console. Websites, applications, screenshots, etc. Boost productivity and increase profit with our employee monitoring software!